Heinz 57 Varieties Sign. For Henry J. Heinz, it all started with horseradish. At the age of 12 he dug it from his family's garden, bottled it and sold it on the streets of Pittsburgh. When he started the Heinz Company in Sharpsburg, Pennsylvania in 1869, horseradish, without turnip filler and bottled in clear glass, was its first product. Later came sauerkraut, mustard, pickles, ketchup and other condiments, outstripping by several thousand the "57 Varieties" slogan of 1896. H.J. was always a master at marketing. His products were packaged in crocks, bottles, tubs and tins with labels that caught the consumers eye with vibrant color and design, like the PLUM PUDDING sign shown here. Storekeepers sold Heinz products, from exquisite display jars. 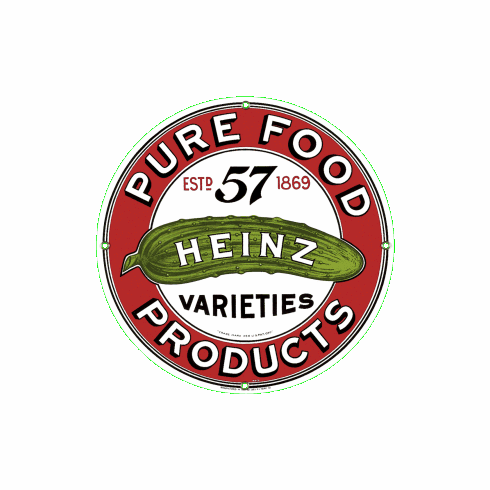 This round HEINZ sign was taken directly from a pickle barrel label.